And as the clouds disappeared and the sun came out, Miss Lily waited patiently for me to catch up and then led me further on down the "Sunshine Trail....."
He was a Prussian aristocrat from the landed Junker class and a long line of soldiers. Patriotic, conservative, Lutheran and a devoted father and husband, he was a believer in authority and obedience. He believed obedience meant soldiers were to follow their leaders and stay out of politics. His name was Erich von Manstein and as the architect of the operational battle plan that felled France in a few months in 1940 and led armies to win battles on the Eastern Front in 1941 and 1942 he was considered by many to be the Wehrmacht’s best all-around general. He was not afraid, as most were, to challenge Hitler on military operations and tactics. They didn’t even like each other most of the time. Yet Hitler quickly recognized Mansteins military brilliance and Manstein would never publically challenge Hitler’s preeminent strategic decisions, flawed as they were. It was early in January 1944 that Field Marshal Erich von Manstein left his outnumbered and outgunned army group on the Eastern Front to personally challenge Der Fuhrer for the last time. He wanted Hitler to stop directing and interfering with army operations and it wasn’t the first time "One thing we must be clear about, mein Führer," Manstein said, "is that the extremely critical situation we are now in cannot be put down to the enemy's superiority alone, great though it is. It is also due to the way in which we are led." Hitler, Manstein later recalled, "stared at me with a look which made me feel he wished to crush my will to continue. I cannot remember a human gaze ever conveying such willpower." Three months later Manstein was relieved of his command. 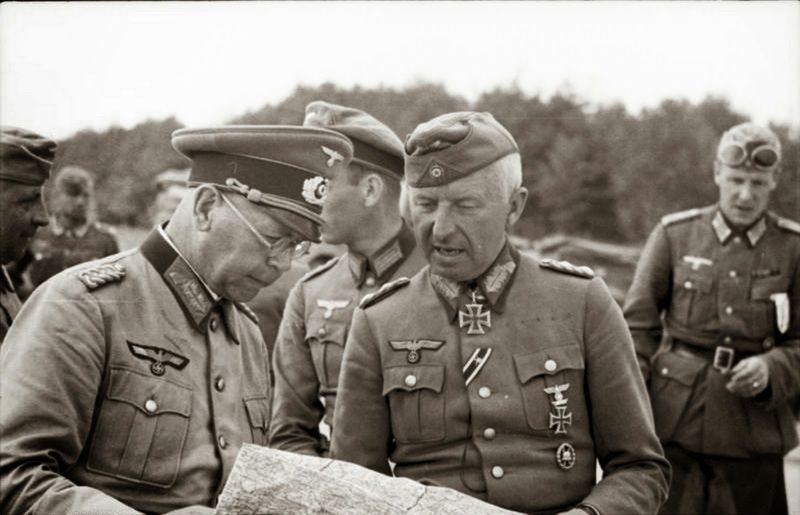 This confrontation, in front of other high ranking officials, is one of the more dramatic scenes in "Manstein: Hitler's Greatest General," Mungo Melvin's interesting, if sluggish at times with technical details, biography of the master strategist and military commander who fought in both world wars. The horror and tragedy of battle is largely overlooked in the enumeration of military maneuvers and units. That includes Stalingrad the largest and most horrific of all the battles which comes across as a chess game. What I was hoping to find in this book was an answer to the question as to why so many upstanding German military leaders followed Adolf Hitler to the death and destruction of their nation and millions of innocents at home and abroad. It seems the most worthwhile questions surrounding Manstein's career involve the moral judgments military leadership. Was he the innocent leader of a professional army, blind to Hitler's ideology and ignorant of what the SS and other extramilitary outfits were up to? Or was he, with other German commanders, aware of the extremes of National Socialism and an enabler of its cruelest policies? Manstein, the main witness for the defense argued that he had served his nation, not Hitler or Nazism. He testified that it was only after the war that he learned of the annihilation of the Jews, only then that he came to believe that Hitler "had no moral scruples." But, as Mr. Melvin makes clear, Manstein's recollections were often self-serving. Manstein took a legalistic stance on the innocence of his soldiers and applied that to himself. They were just following orders. He said he could not have known about all the battlefield "transgressions" and could not have joined an organized opposition to Hitler, given the code of military honor. ("Prussian field marshals," he said, "do not mutiny.") In any event, he claimed, Hitler's overthrow would have brought unacceptable chaos to Germany. Mr. Melvin concludes that "Manstein's misfortune, along with millions of fellow Germans, was to serve blindly a criminal regime." Yes to a degree but not quite. Manstein never joined the Nazis, wasn’t an ideologue but wasn’t stupid or blind either He helped in a big way Germanys path to ignominy. In the end while Melvins book is superbly researched and documented though it is fatally flawed like Manstein himself. Well written biographies today cut to the soul of the subject. Military biography today remains in the genre of the "great leaders of past wars." My bad analogy would be like my six hundred page manual for my new Chevy Cruze. All of that just to learn how to open a trunk? I wanted to take it out on the road and just see how it runs. It not enough to say a general sent this division and another right. How could he ignore thousands of civilians being murdered in his area of responsibility? You need to know the culture, the psychology, the previous history etc. 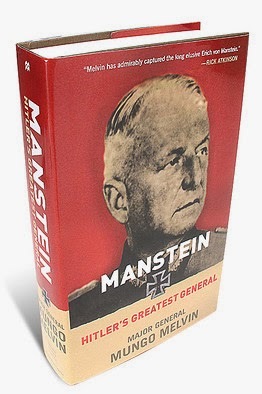 In a sense, the book mirrors the failure of Manstein himself, who, while talented, could not transcend his limitations to achieve true greatness. We never learned what really made him tick. At the end, I remained completely puzzled about Manstein the man and famous general….. That's too bad. 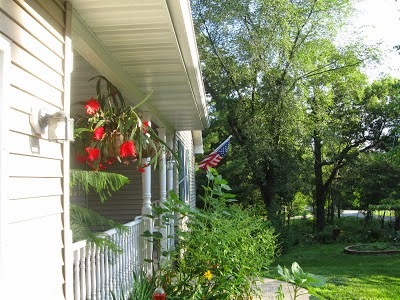 The mid-morning sun cast its light on our home on Oak Hill. It was late September and the birch tree in the front yard was already turning yellow. So far so good with the backseat rider as she showed a lot of patience. Once on the trail though she was anxious to head on out. 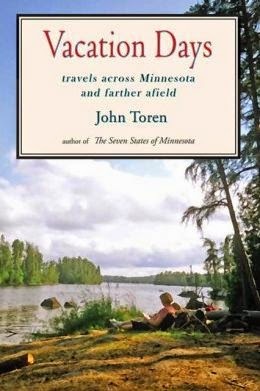 John Toren, author of the best-selling travel guide ''The Seven States of Minnesota,'' shares stories of growing up in Minnesota. Read about summers at the family cabin and excursions to obscure corners of the state and to points farther afield, including the Apostle Islands, the Rockies and Utah's remote canyon country. Whether it’s a book or a movie it’s always fun to connect with scenes of places you love and enjoy. I surely did with Vacation Days. This would also be a good book for those looking for new and great places to vacation. Minnesota itself has pretty much everything except mountains and desert. Fourteen thousand lakes (that’s considerably more than the Ten Thousand our license plates advertise, an inland sea (Lake Superior), Bluff Country (hills and valleys to rival New England), a boreal forest and wilderness canoe area, a prairie/corn growing region and the Twin Cities metro region. Of course, it's Homecoming Week! How could I forget? A little later I had to stop at the local anti-coagulation clinic for a blood test (INR). As usual it was packed with fellow senior citizens awaiting their turn for the blood letting and busily disparaging the youth of today for their bad behavior. Toilet papering the town, on this occasion, seemed to be at the top of the list. I mostly keep my peace until finally contributing that it could be much worse things as evidenced by a few personal recollections of my own misspent youth these many years ago. 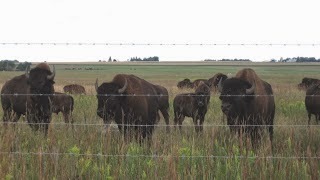 Okay, so we didn't have our roller skates on but we did check out the buffalo herd at Blue Mounds State Park in the southwestern corner of Minnesota. We had taken a short camping break there while a new wood floor was being installed in our living room. 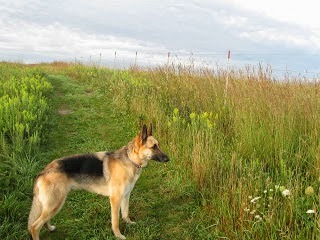 Baron and I had gone for an early morning hike on one of the parks many trails. "Ok Baron. Lead the way." It was sunrise and we followed the fence line for maybe a half a mile before we saw anything beyond a few field sparrows and a flock of migrating nighthawks. Then Baron stopped and began sniffing the air. He started to run ahead and I hurried to catch up. Coming over a small rise, there they were, right along the fence line and beyond. Baron lowered his head watching intently and I heard a low growl, almost a purring sound. 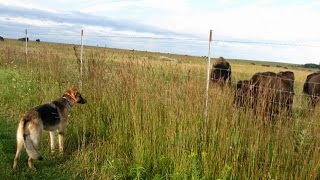 A few of the buffalo began to snort. Still they were curious. "It's okay boy," I said. He gave me that "what do I do now" look. We stood there for some time just watching. Slowly the herd, from all over the hillside approached, eventually to number at least a hundred. 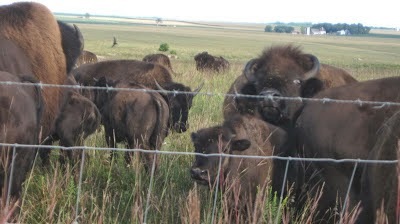 The herd seemed to surround some of the young calves as if they were protecting them. Then one of the "big guys" came right up to me at the fence. I looked at him in my best nonthreatening smile and asked quietly, "You wouldn't mind if we did some roller skating here, would you, Sir?" I got, in return, kind of a wild look, as if I were crazy. 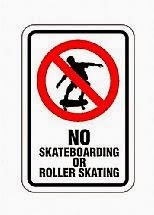 We decided to move on...... and a little bit further on I saw the warning sign. Once in a while I jump off my usual track of reading history and biography. It could be a novel, a memoir, even science fiction. Or underdogs. Laura Hillenbrand’s wonderful Seabiscuit and Unbroken come to mind. Last week it was scuba diving of which I knew absolutely nothing about…. In 1991, a group of divers, including Richie Kohler and John Chatterton, set out to explore an unknown object lying 230 feet below the surface of the Atlantic Ocean and discover an apparent historical impossibility: a World War II German U-boat off the coast of New Jersey. Consulting both the United States Navy and the German Navy both lead to complete denials of the possibility of a World War II-era U-boat wreck in that area. Historical records claim the closest U-boat wreck to be hundreds of miles away. 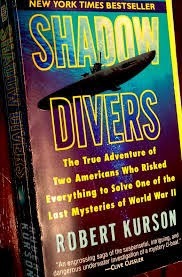 Shadow Divers by Robert Kurson chronicles the seven year quest to learn the identity of the mysterious wreck, dubbed "U-Who" by the dive team, the identities of the men aboard her, and how she came to rest on the ocean floor near New Jersey. Shadow Divers is a quest story, and, as those often are, a story of obsession. 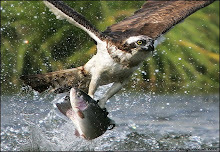 The techniques for deep sea diving were new and catch as catch can. For lots of reasons it was very very dangerous. John Chatterton and Richie Kohler, the two heroes of the story transform what started as an artifact-hunting expedition into a life-consuming obsession that busted both their marriages, nearly killed them, actually killed three of their fellow divers, caused fights and broken friendships, and cost them a great deal of money before they finally succeeded. In spite of the authors best efforts to explain what would drive these men to do what they did it all still comes off as a mystery. Perhaps obsessions are mysteries like that. In the end, common sense and rationality have nothing to do with it. It was an interesting if ultimately unsatisfying exploration of the human mind. Shadow Divers is, however, real-life action/adventure, a portrait of near-insanity, and an exploration of what our inner demons can drive us to. If you enjoy or appreciate ships, history, or discovery stories, or can’t get enough Krakauer you should consider this book. For myself, I don’t believe I’ll be trying deep wreck scuba diving anytime soon….. Between our small porch and the sidewalk lies a tiny plot ground. Here, in the spring, I clean out the little pond and drop in the goldfish. 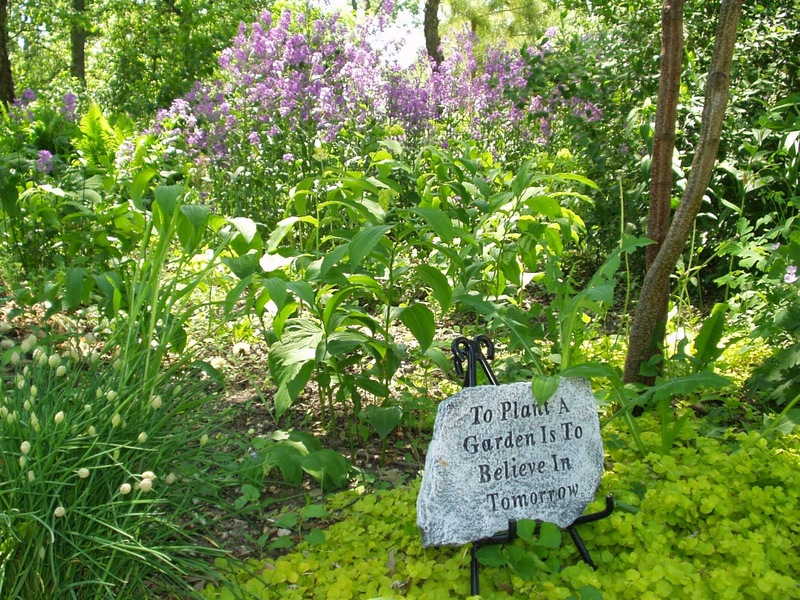 Then I may plant a few coleus or petunias to go along with the yellow iris and hang up the hummingbird feeder and a large ugly thing, that possibly looks like a Christmas Cactus on steroids. It's huge. 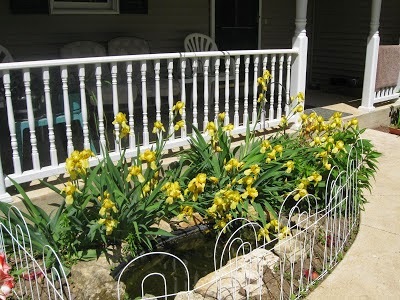 A few weeks later the overgrown patch of yellow iris spring into bloom. About that time I surgically remove all the half dried up arms of "The Thing" . It has been hiding in the basement all winter, away from the critical eyes of Mrs. T, who cares for it naught. 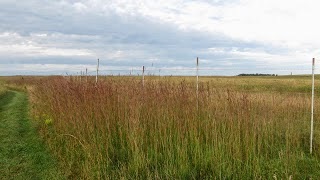 By early July it looks much greener and begins to sprout little buds which quickly grow and begin to open by mid July. Even Mrs. T admits it’s gorgeous (albeit for "only 2 weeks out of the year”.) Neighbors and strangers stop by on the street and "ask what is it?" 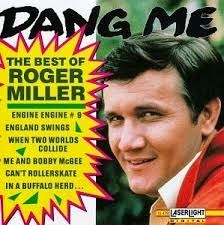 "Well, I say, it was a gift years ago from Mary Ann, but I've forgotten the name. 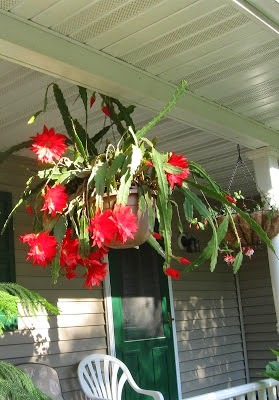 I just call it my giant Christmas Cactus." Then I shrug my shoulders. Maybe you know??? I got more comments that ever before on my question and finally someone had the answer. "This is an Epiphyllum or orchid cactus." 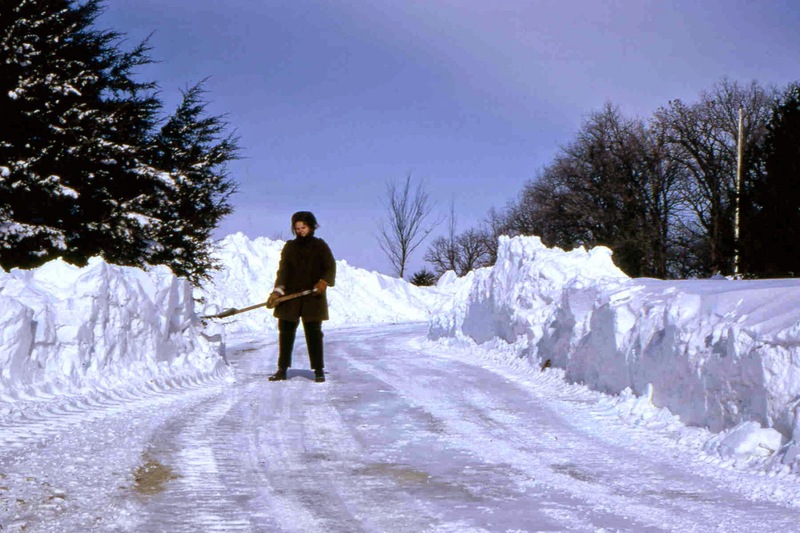 Then I recieved an email from the original source, who now lives far away in retirement, in the North Country. "Your information and photos were of great interest. The mystery plant is an orchid cactus. 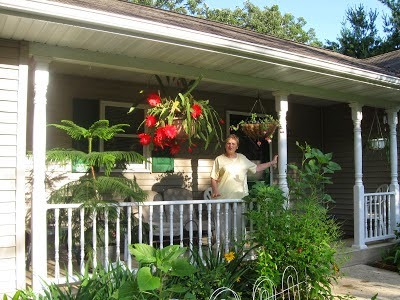 I have two -one has pink flowers and the other has red. They are gorgeous flowers and I have used photos on cards." Mystery solved! Thanks Mary Ann. 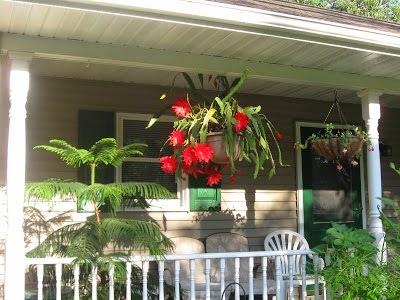 There is an interesting follow-up to this story which begins with the fact that I began to successfully take cuttings and propagate this gorgeous plant to hang on the porch. Eventually in a clearing out downsizing mood I began to learn how to sell items on Craigs List. This included one large extra Orchid Cactus. Having no idea as to its value I put $30 on the item. To my utter and complete surprise a woman from nearby Rochester came to purchase it. Even more surprising was when she told me she had one for years from her mother, had left it in the care of her daughter while wintering in Arizona and came back to Minnesota to find it dead. “I’ve never been able to find another one” she said and then began to cry….. I thought I would pass on an interesting statistic from this season to you. total (450 at bats). Unfortunately, Mauer did not match Bumgartner's ERA. I don't know anything about the Giants but I do know that the Twins have had 4 miserable losing seasons in a row and my fellow St. Paulite former All-Star Joe Mauer is one of the highest paid players in major league baseball. 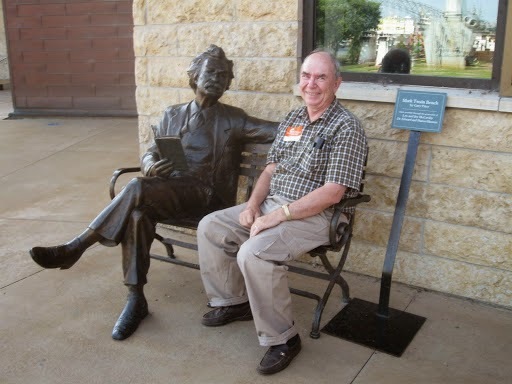 quote, "he is no doubt laughing all the way to the bank."